Recently located was this document from the US government, postWWII. 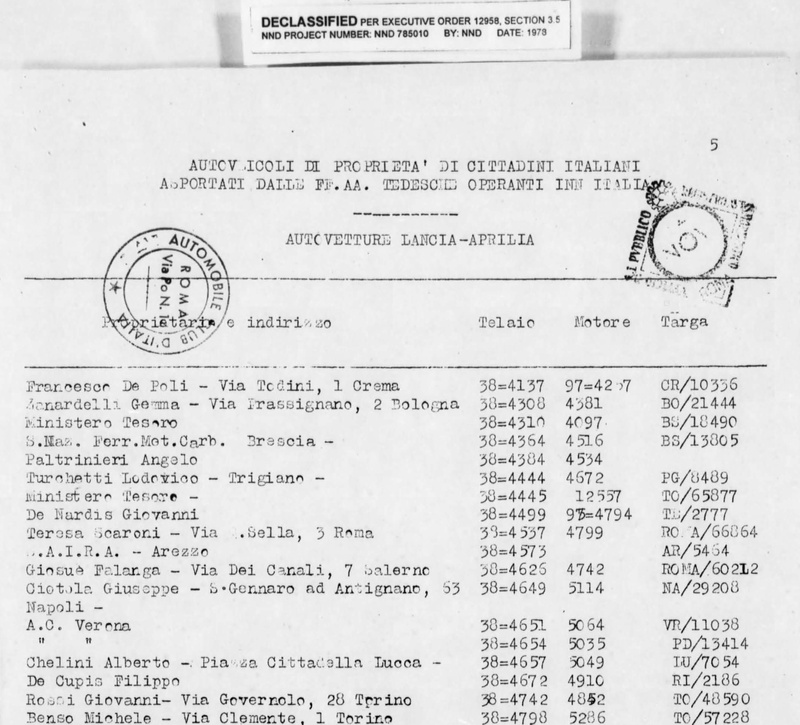 Its a 1948 document listing Italian cars confiscated by the Germans, declassified in 1978. What is interesting for the Lancia world is its extensive lists of Astura, Augusta, Ardea, and Aprilias, complete with owner’s names, registration, and more importantly, chassis and engine numbers. Also included is information for Lancia trucks, including Eptajota, Omicron, Ro and 3Ro. There are about 60 pages in total, with 26 pages of just Aprilia numbers. Originalinformation for early Lancias is hard to find, and this seemed worth sharing. Please forward to any Lancia registries. Just a note – the PDF is large. In front are included a few pages of flavor with interesting period detail. What a fascinating list, you’d have to wonder how many of the cars found their way back to the original owners after the war, assuming they were still with us. The Aprilia list is amazing, especially the number of platform chassis cars, 39 & 439 prefix chassis numbers. And what about the fifty odd Asturas! Hopefully others with more knowledge can fill in some info on a few. I have begun the task of transcribing the Lancias into my Lancia Car Register. Delicious surprises have emerged – some surviving cars, some that turn up in the list of Carrozzeria Boneschi Lancias. There are anomalies and questions. I have found one or two chassis turn up twice. The lists appear to be of vehicles lost by Italian citizens to the German forces during WW2 & particularly after July 1943. It seems the lists were put together by the Italian authorities for submission to the US Allied Commission for Austria (USACA), Reparations & Restitution Branch 1945-1950. They appear in the category “Holocaust-Era Assets – Italian Claims – File 127s (Record Group (RG) 260”. Other files in the 127 series have correspondence on restitution claims for individual vehicles. The Italian lists are interesting as they give the owner & address, chassis, engine & registration number. The pages are headed “Autoveicoli di Proprieta di Cittadini Italiani Asportati dale FF.AA. Tedesche Operanti in Italia”. This translates as “Motor Vehicles, Property of Italian Citizens Removed by the German FF.AA. Operating in Italy”. NOTE that the surname comes first, followed by first names. Many abbreviations are used – for example V. must mean Via for street; F.lli must mean Fratelli for brothers in a company name. The pages are stamped by the “Automobile Club D’Italia, Roma” & by “Ufficio Del Pvblico Registro ?? Mobilistico Roma”. The latter stamp has a date: 7 Nov 47, 13 Nov 47 17 Nov 47 or 19 Nov 47 & others indecipherable but still Nov. The lists are signed by “Il Segretario Generale (GT Canestrini)” if the Automobile Club di Italia. The papers are also marked “Italian claim #127”, presumably entered later by the US administration. One must assume that many of the vehicles were lost for ever and never recovered. Other documents on the fold3.com website contain details of individual cars. So far I have entered all the Artenas (88), Asturas (51), Tipo 34 Augustas (103), Dilambda (1) and a few Aprilias. I am happy to supply a pdf of my transcription. Fantastic work by you on this. Wonderful. It is a magical source, to get all this info back c. 1948. Do you think GT Canestrini is the same as the man we know from Italian auto history? Happy to post your PDF when you are ready. This engine is now in my possession and we are at the moment rebuilding this engine. No Lambda’s in this list!!!!!!!!!!!! !